The scout for the NBA Western Conference team did not take long to come up with a response. For obvious reasons, scouts prefer not to be identified when discussing their evaluations of prospects, but they will give you a good feel for what is going on. "OK, so you tell me," he said. "What's the reason? What are you staying for?" The question was" Would it benefit Villanova's Mikal Bridges to return to the Main Line for his senior season? The answer in the form of a question is something Bridges will contemplate in the back corners of his mind for as long as the Wildcats play this season and until late April when underclassmen have to declare if they are entering the NBA draft. "Everyone's motive is different," the scout said. Texas A&M sophomore Robert Williams "stayed in school because there were things in his game he wanted to work on. He's happy with that decision. "What's your reason for staying? [Michigan State sophomore Miles Bridges] enjoyed college and there was no pressure on him. He stayed because he wanted to work on things and enhance his value coming out [this] year." Mikal Bridges, center, of Villanova dunks over Marquette defenders during the 1st half at the Wells Fargo Center on Jan 6, 2018. There are always things that a player could work during another season in college that would make him more NBA ready. The difference, however, is that Williams and Miles Bridges were true freshmen when they made their decisions to play another year in college. They were teenagers who recognized that another season of physical, mental, emotional and basketball development in college would make them more attractive to NBA teams and likely increase their value for the 2018 draft. Mikal Bridges will turn 22 two months after the draft. He sat out his freshman season as a redshirt and has developed his game in all areas each season. The odds are that Mikal Bridges is not going to have a late-growth spurt, so 6-foot-7 is as tall as he is going to get. And while he might be able to add some bulk to his 210-pound frame, it's not going to be much more than 10 pounds of muscle and that would take the type of training routine that typically isn't going to be available under the constraints of being a student-athlete. 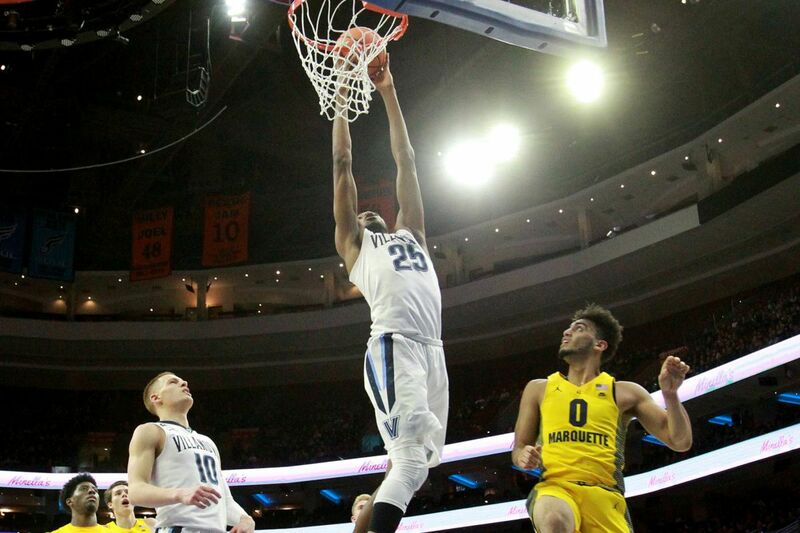 In a nutshell, Mikal Bridges is about all he's going to be physically and NBA teams are already excited about the way he has developed as a player at Villanova. It's almost a consensus that Bridges is a lottery selection who will likely be drafted between ninth and 14th. That's probably not going to improve if he waits another season. "People look at [Bridges] as a junior but he's been in school four years," the scout said. "So I ask again, what would you be staying for?" Mikal Bridges, right, of Villanova and Theo John of Marquette battle for a rebound at the Wells Fargo Center on Jan 6, 2018. What Bridges is right now is the prototype for the current flavor at the top of the NBA hits list — the "three-and-D" wing. That's a player who has the athleticism and length to be a bulldog on defense and the ability on offense to float outside and drain the three-point shot. Sixers forward Robert Covington went from being an undrafted free agent out of Tennessee State in 2013 to develop into a three-and-D player who just signed a four-year contract extension worth $62 million. Going into Wednesday's game against Xavier, Bridges has made 38 of 84 three-pointers (45.0 percent). "Bridges has defined NBA skill in that he can shoot the three ball," an Eastern Conference scout said. "Everyone is looking for someone who can space the floor and he can provide that. He can defend on the ball, and those are things people want to see when you come into the league." The Villanova bench storms the court after Kris Jenkins hit the game-winning shot as time expired to defeat North Carolina and win the NCAA Men’s Basketball Championship. At Villanova, Bridges has won an NCAA championship and may be in a position to claim another this season. He's on schedule to graduate and has played himself into a potential NBA lottery pick. He could return to the Main Line for his final season of eligibility and perhaps he will, but as one NBA scout asked, "What's the reason?"